Nokia now has a complete arsenal of Windows Phone devices from the lowest to the highest price. First, the Nokia Lumia 920 which costs around P26,990, then the Lumia 820 that costs P18,690, the Lumia 720 which is around P14,950, Lumia 620 P11,600 and the most affordable of them all, the Lumia 520 priced at P7,990. 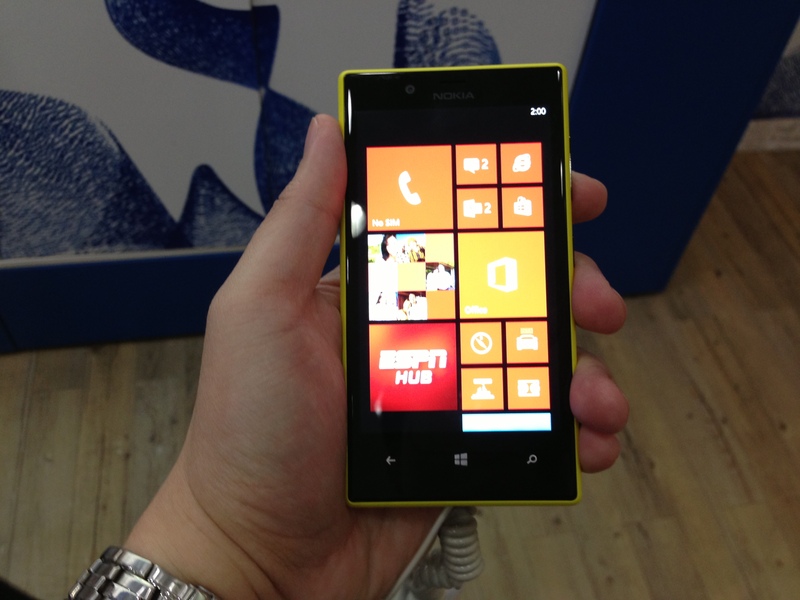 The first time I saw the new Nokia Lumia 720, I fell in love with especially when I found out the features. This will be my new target to buy hopefully this year. – Although the display is just 480 x 800 resolution, which is quite low for some, the 4.3 inch IPS LCD display has Nokia’s ClearBlack Display which produces deeper blacks and better contrast. – Love the colors! The one in the picture is the yellow variant. There are more colors like red, blue, black, white, and many more. The back cover is non-interchangeable so know the color that you want when you buy this. – The 6.1 megapixel camera may be underwhelming compared to phones with 8 or 13 megapixel cameras, but the Lumia 720 has Carl Zeiss optics and with LED flash. The phone takes pictures very well on low light conditions just like its bigger brother, the Lumia 920. – It runs Windows Phone 8. I have been wanting a Windows Phone 8 device really bad! Why? The OS never lags even if the phone has only 256MB or 512MB RAM unlike, ehem, Android. Its very simply and intuitive to use. – Apps? Yes it lags behind Android and iOS but my question is, do we really need all those apps? Mine is as long as I have Facebook, Twitter, and a handful of useful apps which can be found even on Windows Phone is fine with me. Too bad it still lacks Instagram. Its ok. I have an iPhone 5 anyway. – Price. Its only P14,950. I will wait for the price of this one to go lower.